It is exciting seeing the resurgence in interest in space travel, especially the prospect that Mars trips are looking increasingly feasible. Every year, far-future projects come a year closer. Mars has been on the agenda for decades, but now the tech needed is coming over the horizon. You’ve probably already read about Elon Musk’s SpaceX plans, so I won’t bother repeating them here. 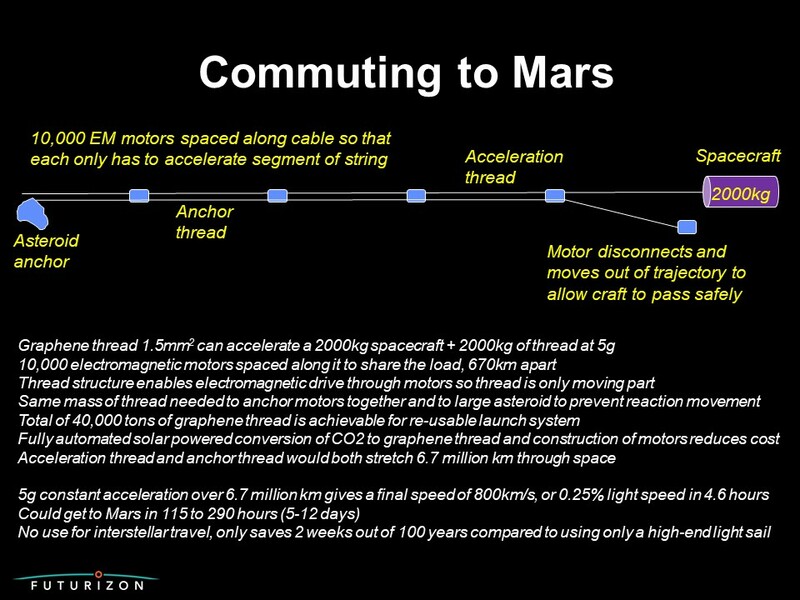 The first trips will be dangerous but the passengers on the first successful trip will get to go down in history as the first human Mars visitors. That prospect of lasting fame and a place in history plus the actual experience and excitement of doing the trip will add up to more than enough reward to tempt lots of people to join the queue to be considered. A lucky and elite few will eventually land there. Some might stay as the first colonists. It won’t be long after that before the first babies are born on Mars, and their names will certainly be remembered, the first true Martians. Sadly, in spite of obviously being far more feasible and shorter term than a space elevator, we have not yet been able to get our paper published in a space journal so that is the only source so far. This picture shows one implementation for non-human payloads, but tape length and scale could be increased to allow low-g human launches some day, or more likely, early systems would allow space-based anchors to be built with different launch architecture for human payloads. The Sling needs graphene tape, a couple of parachutes or a floating drag platform and a magnetic drive to pull the tape, using standard linear motor principles as used in linear induction motors and rail guns. The tape is simply attached to the rocket and pulled through two high altitude anchors attached to the platforms or parachutes. Here is a pic of the tape drive designed for another use, but the principle is the same. 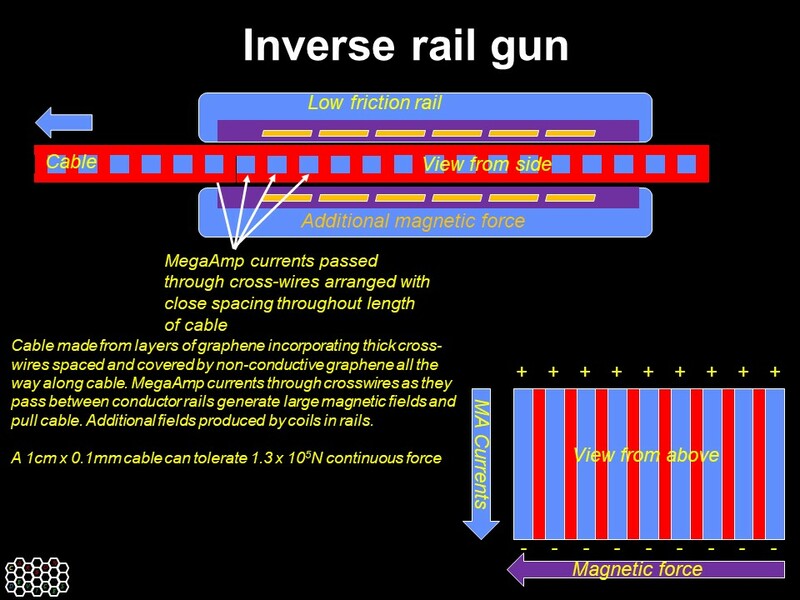 Rail gun technology works well today, and could easily be adapted into this inverse form to drive a suitably engineered tape at incredible speed. All the components are reusable, but shouldn’t cost much compared to heavy rockets anyway. The required parachutes exist today, but we don’t have graphene tape or the motor to pull it yet. As space industry continues to develop, these will come. The Space Elevator will need millions of tons of graphene, the Sling only needs around 100 kilograms so will certainly be possible decades before a space elevator. The sling configuration can achieve full orbital speeds for payloads using only electrical energy at the ground, so is also much less environmentally damaging than rocketry. Using tech such as the Sling, material can be put into orbit to make space stations and development factories for all sorts of space activity. One project that I would put high on the priority list would be another tape-pulling launch system, early architecture suggestion here:. Since it will be in space, laying tape out in a long line would be no real problem, even millions of kms, and with motors arranged periodically along the length, a long tape pointed in the right direction could launch a payload towards a Mars interception system at extreme speeds. We need to think big, since the distances traveled will be big. A launch system weighing 40,000 tons would be large scale engineering but not exceptional, and although graphene today is very expensive as with any novel material, it will become much cheaper as manufacturing technology catches up (if the graphene filament print heads I suggest work as I hope, graphene filament could be made at 200m/s and woven into yarn by a spinneret as it emerges from multiple heads). In the following pics, carbon atoms are fed through nanotubes with the right timing, speed and charges to combine into graphene as they emerge. 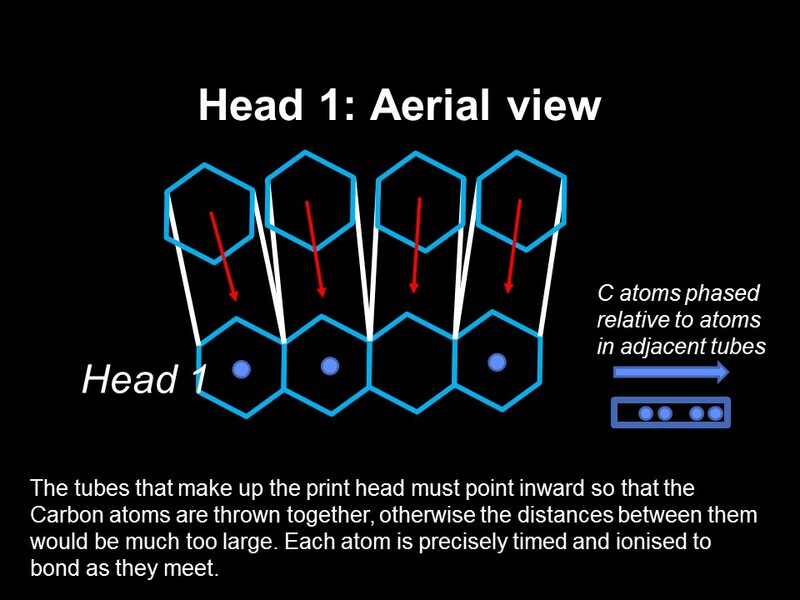 The second pic shows why the nanotubes need to be tilted towards each other since otherwise the molecular geometry doesn’t work, and this requirement limits the heads to make thin filaments with just two or three carbon rings wide. 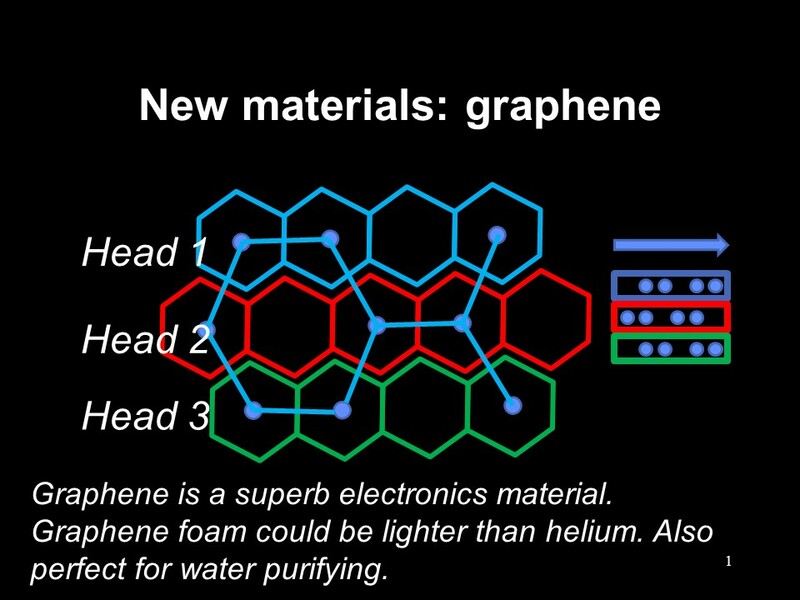 The second pic mentions carbon foam, which would be perfect to make stratospheric floating platforms as an alternative to using parachutes in the Sling system. Graphene filament head, ejects graphene filament at 200m/s. A large ship is of that magnitude, as are some building or bridges. Such a launch system would allow people to get to Mars in 5-12 days, and payloads of g-force tolerant supplies such as water could be sent to arrive in a day. The intercept system at the Mars end would need to be of similar size to catch and decelerate the payload into Mars orbit. The systems at both ends can be designed to be used for launch or intercept as needed. I’ve been a systems engineer for 36 years and a futurologist for 27 of those. 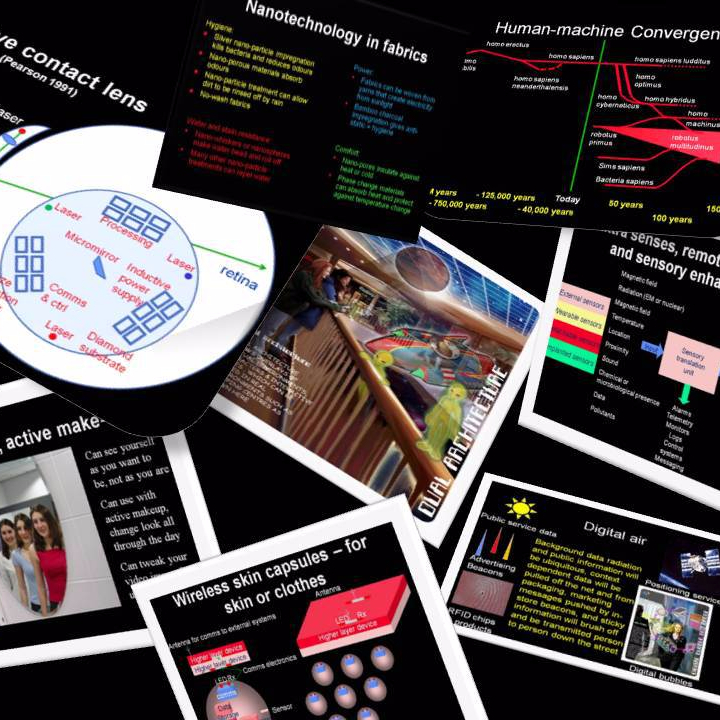 The system solutions I propose should work if there is no better solution available, but since we’re talking about the far future, it is far more likely that better systems will be invented by smarter engineers or AIs by the time we’re ready to use them. Rocketry will probably get us through to the 2040s but after that, I believe these solutions can be made real and Mars trips after that could become quite routine. I present these solutions as proof that the problems can be solved, by showing that potential solutions already exist. As a futurologist, all I really care about is that someone will be able to do it somehow. So, there really is no need to think in terms of months of travel each way, we should think of rapid supply chains and human travel times around a week or two – not so different from the first US immigrants from Europe. This is just an extract from my sci-fi book Space Anchor, about the adventures of Carbon Girl and her boyfriend Carbon Man. However, the Space Anchor itself is based on the Kasimir effect and warped space time, so has some similarities with NASA’s warp drive, but will be a lot easier to make and require very little energy. If their’s works, so will this. The space anchor will arrive first, and the most likely route to NASA getting their warp drive is using my space anchor to find another civilisation that already has a warp drive and buy one. Anyway, both remain scifi for a few decades. Just as well really. The Warp drive NASA are playing with will be used first as a weapon system to make ultra-high-lethality kinetic weapons. Let’s hope it doesn’t work. Looks pretty though, I’ll give them that. It was just a routine chat. G’din debriefed the General on the last trip, mapping out space currents. That often took him near planets and moons, and often meant he’d had to dodge asteroids. This one had been an unusually bad trip with several near misses. Unfortunately, it was moving mass that created the ripples and currents in the space time fabric that the space anchor used. Without it, they’d have no means of ever getting much further than the solar system. Other techniques such as warp drives were still just science fiction. Nobody had any serious means of getting the speed without carrying massive engines and huge quantities of fuel. The space anchor cheated. The C14 didn’t use much fuel at all, and had fairly basic engines for local travel near Earth. The anchor locked on to the local space time fabric itself. There was no matter there, but it used stacked graphene Kasimir combs, each couple of combs interleaved to create a chamber where virtual particles could appear as the slats separated and be immediately separated from one another as the slats interleaved. High speed waves travelling along the combs opened and closed the gaps rapidly. The combs essentially harnessed the virtual particles’ fundamental need to annihilate by trying to physically prevent them from doing so. Creating a temporary barrier between them simply delayed their annihilation, creating a quantum annihilation pressure. Each frustrated annihilation only caused a tiny force measured at macro scales, but there were a lot of layers in the graphene stacks, and it added up nicely. Even though their lives were short, the strong forces the quantum annihilation pressures generated effectively locked the anchor onto that piece of space. Nature may abhor a vacuum, but it absolutely won’t let you steal it away. That would make holes in space time. Nature doesn’t allow holes in space time any more than it allows a tree in a forest to be replaced by an error message saying “tree not found”. So the space anchor behaved exactly like an anchor should. It stayed where it was put, relative to the local space time. In future space battles, it would undoubtedly be useful for fighters to make rapid turns without using all their fuel. For now, thankfully without those space battles yet, they were happy to use it to make trips faster and shorter. If the region of space at the anchor was expanding differently from the region where the ship was, which of course was the general idea, the anchor would create a huge force to pull the ship. So, just like a yacht using differences in the winds, the space anchor allowed the C14 to accelerate and brake. Like wind, vacuum energy was free and didn’t need fuel to be carried. The tether was long, but that wasn’t a problem in space. The trouble was, just like wind, it isn’t easy to spot a space current from far away, it is much easier to detect it by being there. Astro-physicists knew where to look for the best chance of finding stronger currents of course but the mapping was still needed. The forces had to be measured, the streams plotted. They had to know where they were, how strong they were, how they behaved. It was very new science and technology. Space-time turbulence had been discovered that could cause very severe vibration when an anchor was being used, although if the anchor was switched off, it would instantly become smooth again and the ship would coast. One day, space travel would all be easy, but just a few decades in to manned interplanetary travel, it was still anything but routine. Only a few ships were equipped with space anchors, they were not easy to make and were expensive. The C14 had the first one, since G’din had invented it, and it was still be best equipped ship to do this kind of work. It had three anchors now, improving manoeuvrability – on a good day, G’din could swing it around like a gibbon in the woods. Space research, tourism, asteroid mining companies and of course the military of many countries all wanted the technology too. But without the other stuff – the Higgs filters, Heisenberg resonators and carbon fur, the anchor was as dangerous as it was useful, and few organisations had ships made out of the materials that could resist even the minor impacts. Most would be riddled with holes on the first trip. So only G’din and the military had them so far, the rest could wait till it was safer.